I was not always a fan of oysters.Hubby's father loves them and over the years he continued to offer them up hoping to get me to like them. But on the few adventurous times I tried them, I thought them dull and mushy. The closest I came to enjoying them was when our friend Julia Child taught me to shuck. Julia had received a bag of oysters from a farm in Washington State and invited us to share them with her. We sat in my neighbors kitchen and Julia, in all her wisdom, told me that it was technique not strength that opened an oyster. Always an attentive student, I was excited to learn the mysterious trick of shucking, even if it was knowledge I didn't really need at the time. Actually, I couldn't help but enjoy oysters while chatting and shucking with Julia, and while the oysters weren’t bad, I was still not a huge fan after that night. It was over 10 years, and not many oysters later, that Hubby and I discovered Island Creek Oyster Bar in Boston and the world became my oyster, pun intended. One and Only Son was recruited to play soccer at Boston University, matriculating in 2011. By the time he moved, I had only been to Boston three times in my life; the first was when I was living in New York in the 1980's, then two more times to look at colleges. Boston was a whole new place full of new restaurants to explore and I couldn’t wait to dig in. It has a great culinary reputation and I was hungry! One of the first places we headed was Island Creek Oyster Bar (ICOB). Given my oyster aversion, the name did not endear me so it was not my first pick of restaurant. But it was cold outside and it was next door to our hotel so I was willing to give it a try. Fortunately for me they offered more than oysters, but Hubby couldn’t wait to try the oysters from their own farm just south of Boston; restaurants don't get them any fresher than that! Hubby’s enthusiasm encouraged me to give the oysters a try and I was not unrewarded. Maybe it was the setting, maybe it was their freshness or temperature or whatever, but they were clearly, undisputedly, the tastiest oysters we had ever had. I was hooked. We visited ICOB so many times that first year, and ate so many oysters while in Boston to watch soccer games, that the owner gifted us with our own shucking knives. Garrett is a friendly restaurateur who watches over his restaurants carefully and noticed our frequent attendance. He was delighted that he got us so hooked on oysters that we were ordering them by the bag from the farm, delivered to California. We weren't the only ones hooked on the oysters. When One and Only Son was between games and we were in town, he would join us at ICOB for an oyster fest. He is a big boy, and boy does he love oysters! So of course, when he was home in California for the holidays, we decided we needed to throw an oyster party. I ordered a bag of 100 oysters, got out the shucking knives, and taught my children to shuck, just like Julia had taught me. That is the wonderful thing about knowledge; as useless as it may seem at the time, you never know when it will come in handy! Oyster night turned into quite an occasion. We invited some special friends, our three children invited their friends, and we rented a trolley to take us all around town to see the Christmas lights. We didn't want to host a dinner for the 31 guests that could fit on the trolley, so we settled on an oyster and cheese bar, along with french champagne and crisp wines to get us in the holiday spirit. What is more festive than bubbly and oysters around the Christmas tree? Trolley night, resplendent in holiday lights, oysters on ice, and the cheer of good friends, was a highlight that winter of 2011. And even though oyster farms have the ability to offer oysters year round, I like to save the pleasure of an oyster party for winter when my children are all home and the taste of the ocean seems like a special treat. One and Only Son shucking. After year one of the oyster bonanza, I decided that I wanted to know more about this oyster farming. 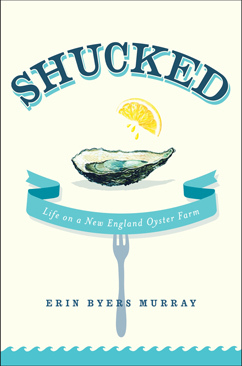 I came across the book Shucked: Life on a New England Oyster Farm and became fascinated by the farming process and it’s proximity to Boston. I decided that a trip to Duxbury was in order so I could get an up close look at Island Creek Oyster Farm (ICOF). Hubby made the call and we were warmly welcomed to the magic that is oyster farming. On a gorgeous September day in 2012, our hostess Michelle introduced us to CJ, our friendly and ruggedly handsome oyster expert and off we went...first to the indoor tanks where seeds are “sprouted” then off in a boat out to view the miraculous oyster-growing process. The highlight, of course, was the oyster tasting out on the float in the bay where we were treated by a visit from Skip, the founder and owner of ICOF, along with his brilliant daughter and friend whose love for ocean life brimmed as they showed me the flounder they had caught and explained how both it’s eyes were on one side of the flat body. They also caught lobsters and crabs and clams and knew more about each of these creatures than I ever learned in Marine Biology class. Meeting these enthusiastic young girls was as much of a treat for me as tasting the oysters and learning about the special green crates identifying the “Per Se” oysters. Great read for oyster lovers. Per Se, a french phrase meaning in itself or intrinsically, is the name that Thomas Keller, of French Laundry fame, chose for his New York restaurant which opened to rave reviews in 2004. Per Se was quickly considered one of the top restaurants in America, and now the world, and Mr. Keller takes ingredients very seriously. So seriously in fact that Island Creek Oyster Farm has a special crate color for the oysters chosen to send to Mr. Keller for one of his signature dishes, Oyster and Pearls, which is served daily at both Per Se and The French Laundry. These oysters must be a certain size and uniformity as well as depth of cup and shell smoothness. Each Per Se oyster is selected by hand and placed in the special green crate before daily shipment to its final destination as one glorious bite of Oysters and Pearls, created to delight the senses and leave you begging for more. Fishing out a Per Se oyster. I would not be so presumptuous as to try and re-create Oysters and Pearls. With the amount of oysters that One and Only Son can consume, I would need the entire staff of Per Se to do it justice. In my kitchen, we serve Island Creek Oysters, freshly shucked by the available hands of the day, on ice, with lemon wedges, and they never last long enough for the ice to start melting. If we are feeling a little saucy, we offer a touch of jalapeno tabasco or a green chile sauce, to compliment but not mask the fresh ocean flavor of the oysters. If we are feeling super saucy, we add a splash of vodka to the chile sauce before serving. Saucy or not, we happily slurp away and give thanks to Skip and the crew for working so hard to keep the oysters coming. Fill a serving dish with crushed ice and shuck the oysters. If you don’t know how to shuck, get someone to teach you or watch a video online and be careful not to shuck a hole in your hand! Place the 1/2 shells open on the crushed ice about 15 minutes before serving so they get good and chilled. ( I like to set them on the ice and then put them in the refrigerator.) 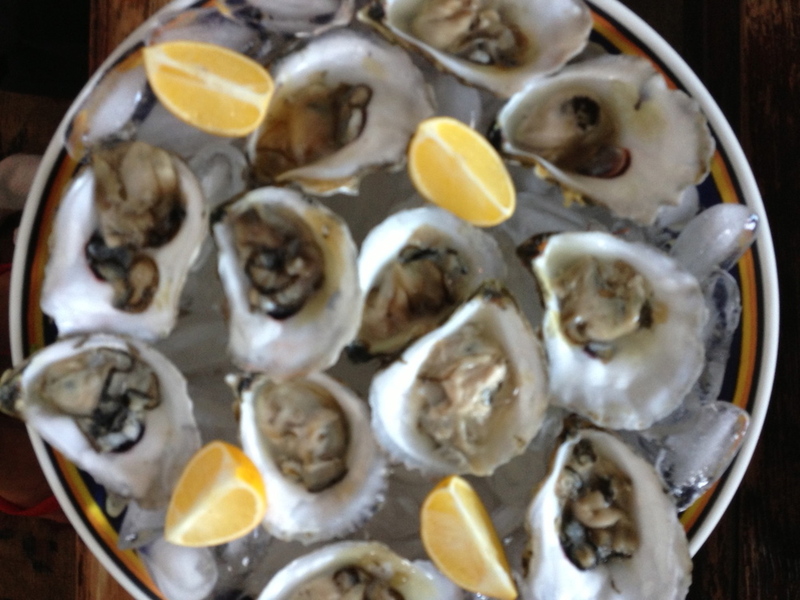 Place the lemon quarters around the oysters. Gather around and slurp away, squeezing a bit of lemon juice on the oyster if you choose and/or spooning a dash of sauce on top. Put all ingredients into a blender and puree into a thick green sauce. For extra saucy oysters, add the vodka to the sauce! Smoked salmon holds a special place in the memories of all our children, but not exactly in a good way. When Baby Girl was about 4 years old, Hubby had a two-week business trip to London so I decided to pack up my gang and go with him. Hubby traveled a lot in those days so we traded in his zillions of miles for business class seats and off we went. The children were having a splendid time and the flight attendants were loving my young trio who were asking questions, accepting every dish served and then trading foods with each other. Firstborn Daughter liked most everything so she was willing to share whatever came across her plate. One and Only Son liked nothing so he ate everyone's bread rolls and possibly all the butter. Baby Girl ate the smoked salmon. I mean ALL the smoked salmon. She ate hers. She ate mine. She ate her brothers and her sisters and her dad's and she likely got second servings from the delighted flight attendants who thought it was adorable that this tiny 4-year-old toe-head could eat more salmon than most adults. At the end of Baby Girls salmon fest, I wiped her down the best I could with damp napkins and let her drift off to sleep. But let's think about this--which clearly I didn't at the time because I was probably a tiny bit exhausted from the packing and traveling--smoked salmon is oily. It is oily and fishy. And 4-year-olds eat with their fingers and they are messy. It didn't occur to me that there might be many places she wiped her hands while eating, like, for example, her clothes and hair. Imagine wiping smoked salmon all over a towel and then sitting that towel in a warm place for a good eight hours. How do you think that towel might smell? Poor Baby Girl. The flight attendants woke everyone up for landing and it wasn't more than a few minutes before one of my children said to Baby Girl in a loud and not pleasant voice, "You SMELL!" They were unhappy, she was unhappy and it was a long cab ride to the hotel where we tried desperately to remove the smell from her hair by numerous washings. I remember thinking I needed tomato juice or whatever you use for skunk removal because the smell just wouldn't go away. I tossed her clothes in the trash, doused her with some fragrance and tried to make light of the situation. But kids can be so mean. They teased her and teased her and teased her some more about her fishy hair. And when she finally started crying and said she couldn't help it, they stopped. But only for awhile. Once the smell was gone, they brought out the story again. And again. And fifteen years later, a year doesn't go by that one of them doesn't talk about Baby Girl and her fishy hair. Whenever we travel, they announce that they hope there is no smoked salmon on the plane. She doesn't cry about it anymore, but I'm not sure Baby Girl eats smoked salmon to this day EXCEPT for this recipe which I acquired a decade before she was born. It is so good that I crave it and it is so easy that I occasionally just make it for Hubby and I as a nice way to kick off the weekend. Kate’s was a tiny restaurant in an old house tucked away near downtown Austin, Texas. It served fresh, modern, simple food and we loved the ambience and the owners and their cuisine. I don’t think Kate's was there very long because I remember being sad when it closed and we only lived in Austin for two years. But we went at least a handful of times and we always ordered the Potted Salmon. Potted Salmon was served in a little ramekin and it was a lovely pale salmon color. It tasted rich, and salty, and sweet, with just the right amount of salmon flavor. It was perfect with a glass of champagne. We may not have had much money in those early years of our marriage, but we spent it well. We would have a glass of beautiful French Champagne and split the Potted Salmon. Kate told me how to make it one night and I was so happy she had after making it at home a few times after the restaurant closed its doors. Then years later, we prepared it with our friend Court, a friend from Austin who had also frequented Kate’s restaurant. Court has an incredibly precise palate and is very analytical when it comes to food preparation. He suggested that some cognac might really improve the flavor. Court was spot on and I have never gone back to my original recipe without the cognac. Kate’s Potted Salmon with the addition of cognac has been served to many of our guests, at many cocktail parties over the years. I don’t know where Kate is today but I hope she is still cooking somewhere and creating beautiful, simple food that creates happy memories. Put the butter, salmon and cream cheese in a food processor and process until smooth. Add the lemon juice and cognac and pulse until incorporated. Spread into ramekins, cover with plastic wrap and refrigerate overnight. Let sit at room temperature for 15 minutes or more before serving. 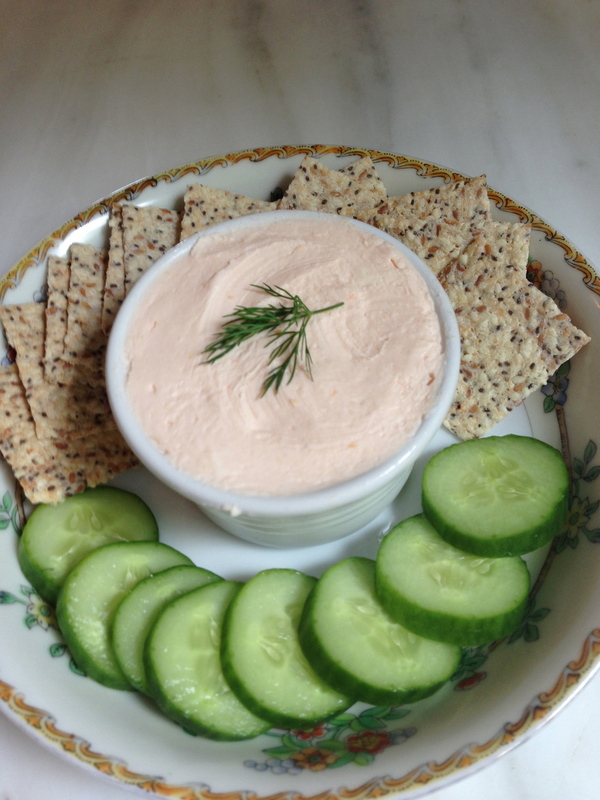 Spread onto cucumbers and garnish with dill or serve in the ramekin with crackers on the side. Don’t forget the champagne! I first tasted a fava bean the summer of 1997 on a farm in Gisborne, Australia.My father had passed away that September and in December, we went to have Christmas with our friends on their farm in the country outside Melbourne. I spent many hours walking through the acres of beautiful gardens, sitting on the bench by the pond, and thinking about Dad. I felt much sadness that Christmas time, but being in the Antipodean summer heat so far away from the chill of California, was refreshing and restoring. We decorated the Christmas tree, secretly wrapped gifts that Santa would leave by the fireplace for our young children, and picked vegetables for our simple, fresh dinners. The garden must have been a full acre, the large raised beds in long rows, surrounded by fruit orchards, an enormous compost bin, and a chicken coop providing fresh eggs. There was an entire bed each of asparagus, peas, lettuces, carrots, tomatoes and more. Plants of all kinds produced vegetables in quantities well sufficient for a house full of children and adults. The most memorable to me that year were the fava beans. I don’t believe I had ever seen a fava bean, also known as broad bean, before that summer. At least I hadn't seen one still in the pod on the plant. The Gisborne garden had an abundance of them, tall and rigid and unruly in their growth. The plants are popular in producing gardens because they are a cover crop used to nourish the soil in between plantings and restore the nitrogen. Many people don’t bother with the actual harvesting of the beans which, as I discovered, is quite a labor of love. We enlisted the children to help pick and returned to the kitchen with a large bowl filled to the rim with extra-large bean pods. It takes many hands to make light work of fava beans. You shell and boil and peel before you arrive at the soft green kernel suitable to eat. But with a little fresh mint and butter, they were worth the effort and I had discovered a new food that we all enjoyed. Returning to California, tanned and relaxed and ready for the new year, I set out to relive the joy of the fava beans. I looked for recipes and searched the grocery for them and eventually, after time and life took over, I forgot about them and never made them after that lovely Australian Christmas day. Years later, I saw a photo that took me back to my time on the farm when I was grieving my father, and I thought of the fava beans. However, fava beans were no more available or any less work than in the past so I decided to do as I usually do and make something inspired by the farm favas. I bought frozen lima beans, picked fresh mint and lemons from my garden, and adapted a Martha Stewart recipe for fava bean crostini. My lima bean puree has been called many things over the years, including “that green spread stuff” by one of my children, but history has proven that it is a simple, reliable and delicious appetizer that is loved by all. Drain lima beans. Put all ingredients in a food processor and process until smooth. Remove to a bowl and chill until ready to serve. 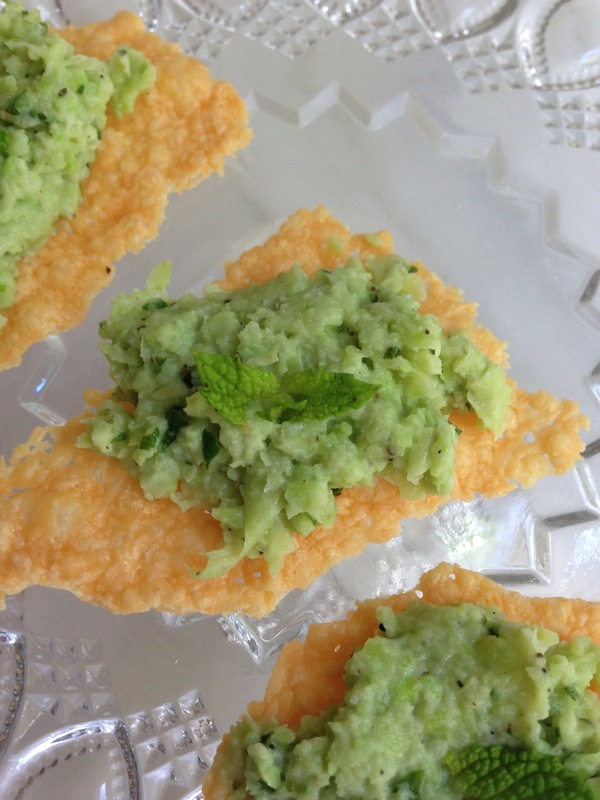 Spread a generous amount of the spread onto a parmesan crisp and top with a small mint leaf or piece of a leaf. Parmesan crisps are available at many gourmet shops and grocery stores. They are also quite easy to make by frying mounds of fresh grated parmesan cheese in a nonstick skillet until melted and slightly brown. Note: Hubby is not a huge fan of parmesan crisps and he prefers the puree spread on a cracker with a shaving of fresh parmesan cheese on top.